The Department of Forestry and Fire Management has a number of recognition programs to honor and acknowledge those working throughout Arizona to promote and achieve sustainable urban forests. Communities, stakeholders and residents are encouraged to submit nominations for recognition. The 2019 Arizona State Arbor Day Award Ceremony nominations are now open! Tree City USA is a prestigious designation that Arizona cities can earn by meeting minimum standards for community forestry programs at the municipal level. 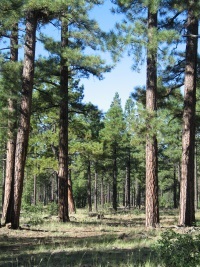 A program of the Arbor Day Foundation and the National Association of State Foresters, the program is administered in Arizona by the Arizona Department of Forestry and Fire Management - Urban and Community Forestry program. Tree City USA recognizes communities that have developed urban forestry programs and that proactively plant and care for trees. Tree Campus USA is a prominent designation that Arizona colleges and universities can earn by meeting minimum standards for campus forestry programs. 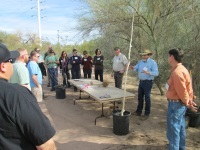 A program of the Arbor Day Foundation and the National Association of State Foresters, the program is administered in Arizona by the Department of Forestry and Fire Management - Urban and Community Forestry program. Tree Line USA recognizes public and private utilities that effectively promote the dual goals of safe, reliable electric service and abundant, healthy trees across utility service areas. The Citizen Forester of the Year is someone who upholds and demonstrates values associated with a dedication to forestry and responsible management of forest resources. This person is a constructive member and dedicated volunteer within their community and is currently not employed as a forester or in a related field. This award is given to an exceptional business whose work provides innovative leadership or contributions of talent and effort that enable the advancement of sustainable community forestry efforts at a local or state level. This award is presented to an exemplary government official or employee, who through extraordinary efforts, has significantly and positively contributed to and enhanced urban forest management at a community or state level. To increase the recognition of outstanding urban forestry projects in Arizona, this award is presented for the innovative strategic, and/or pioneering collaborative efforts of organizations in Arizona. It recognizes a project for exceptional involvement of multiple organizations implemented during the past year. Sign up for the Urban Tree Talk newsletter by email! See our Archived Urban Tree Talk Newsletters for past issues.